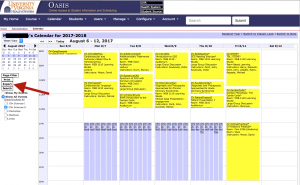 OASIS – Online Access to Student Information and Scheduling. Students use it for course schedules (primarily pre-clerkship courses), grades, evaluations, and requirement checklists. Using a web browser OASIS can be accessed at https://oasis.med.virginia.edu. All support questions should be directed to mededweb@virginia.edu. 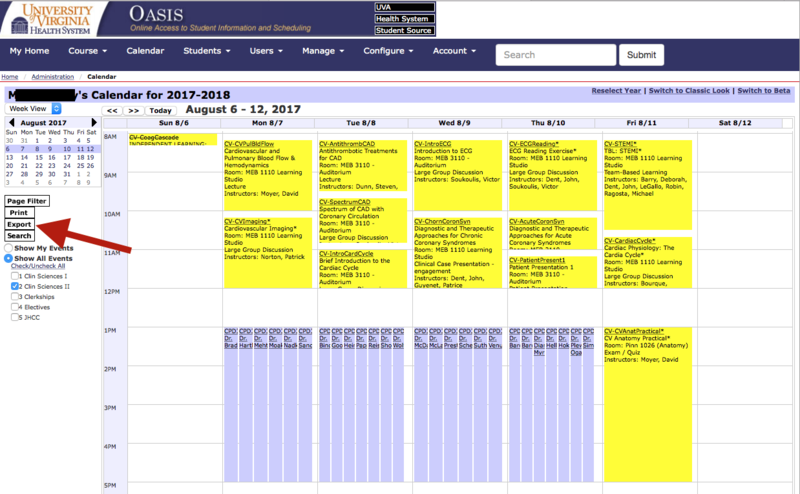 In addition to viewing your schedule within OASIS, you have the ability to export your calendar into a common calendar format and subscribe to it in your UVA Health System account (Outlook Webmail), your UVA academic account (Google Calendar), your mobile device (iOS or Droid calendar), etc. Doing so is a two-step process: Generate the URL from Oasis and Subscribe to the calendar feed in your preferred calendaring application. The steps are below. Log into Oasis and click on the “Schedule” link at the top. This will display your calendar. Underneath the month view, click on the button that says “Export”. Choose your “Calendaring Application” dropdown box. Select other options as needed. To ensure that your full schedule is exported, select “18 weeks” in the “Number of days to export” dropdown box. After choosing the options, press the save button at the bottom of the page so that the the “URL” field is populated. “Copy” the value for the “URL” field because this is the internet address of the calendar and you will likely need to “Paste” it into your calendaring application. If using a calendaring application like Outlook WebMail or Google Calendar, start that application. 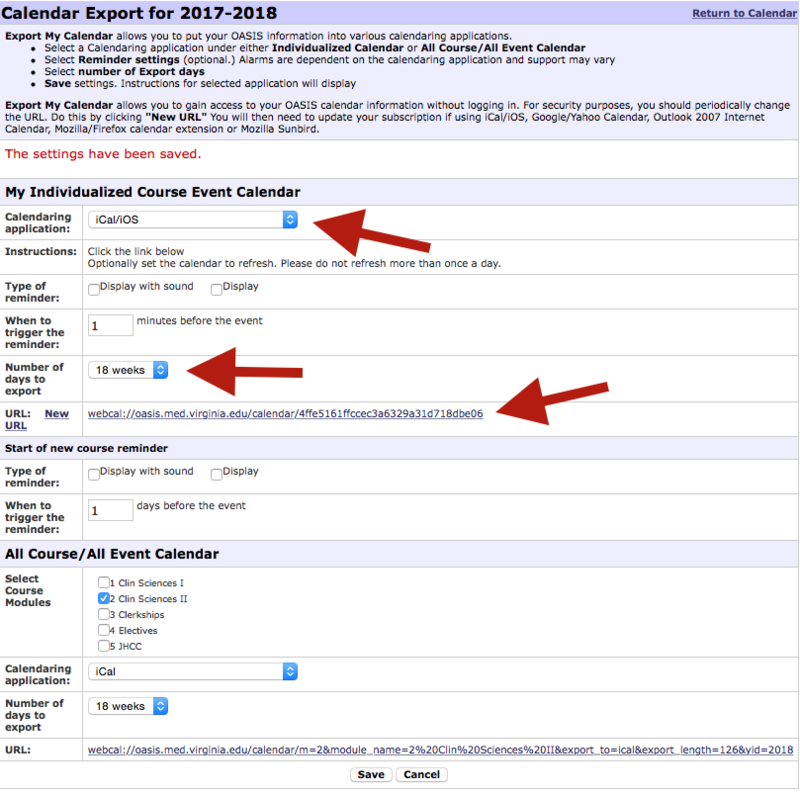 On the “Other Calendars” item you can typically right-click to access a sub menu to “Add a Calendar” (Outlook WebMail) or “Add by URL” (Google) and “Paste” the value of the “URL” field that you just copied. 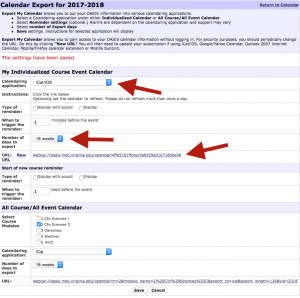 Your Oasis calendar should appear under the “Other Calendars” item and can be selected, renamed, etc. If using IOS you typically subscribe to internet calendars by clicking on the URL; so, send yourself an email with the URL pasted into it, open the email on your mobile device, click on the URL, and accept the prompt to subscribe to the calendar. The calendar feeds are updated periodically, depending heavily upon your preferred calendaring application. Practically, we find that is takes at least 24 hours for updates to move from the Oasis schedule to our calendaring application. Student schedules are created each summer (typically in July) so the internet address changes at that time. As a result you will typically need to repeat the calendar export and subscription process once a year.